Core control. That is the foundation of Pilates and the key to a stronger, more stable, healthier you. 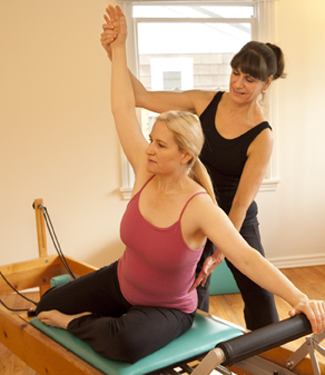 Pilates emphasizes the development of the whole body. By focusing first on strengthening your core — the deep muscles of the abdomen, back and pelvic floor – this technique creates the stability that is essential to a balanced body. Using smooth, concise movements, focused breathing and progressive resistance, Pilates stretches and strengthens your body, building strong, lean muscles, increasing range of motion and improving posture, flexibility and joint integrity. Pilates technique can be effective for everyone from pregnant women to elite athletes.